Myelomeningocoele requires a multi-disciplinary approach. At Red Cross Children's Hospital the weekly spinal defects clinic involves neurosurgeons, urologists and stomatherapists (who teach the patients bladder and bowel care), orthopaedic surgeons and orthoptists. Neurosurgeons do the primary closure and insert and maintain a ventriculo-peritoneal shunt in 95% of the patients who have hydrocephalus due to an Arnold-Chiari malformation. Urologists treat the ninety per cent of patients who are incontinent. Orthopaedics has protean applications in myelomeningocoele. The patient's needs in order of importance are:4 a stable self-image, an adult sexual role, independent communication, daily living activities, a career and mobility. It is important to note that walking ability is last on this list and that orthopaedic management should be realistic, keeping in mind the patient's walking potential. The ambulatory status was defined by Hoffer5 et al. A functional walker implies a community or household walker, while a non-walker is permanently in a wheel-chair or walks with assistance during exercise only. The patient's walking or ambulatory potential is mainly determined by the neurological level.6,7 Spasticity, obesity and deformity can also influence walking ability. Babies should be assessed several times before the parents are given a prognosis for walking potential. Level is defined as the lowest level of voluntary power equal to or more than MRC 3/5. Spasticity and skip lesions can rarely occur below this level, but are rare.8 Table I gives the incidence per level as seen in our unit. The walking potential for each neurological level is shown in Table II. The presence or absence of quadriceps determines whether the patient will walk or not. Without quadriceps the patient is paraplegic. Midlumbar (L3 and L4) patients walk with ankle-foot orthoses (AFOs) as they have flail feet, and require crutches as they have no hip abductors (gluteus medius, L5) and no hip extensors (gluteus maximus, S1). Midlumbar (L4) patients will walk into adulthood because they have medial hamstrings which contribute one third of hip extension power.9 In my experience patients with L3 level seldom walk as adults. Midlumbar patients learn to 'backset' their hips with a baby walker and then graduate to AFOs and crutches. 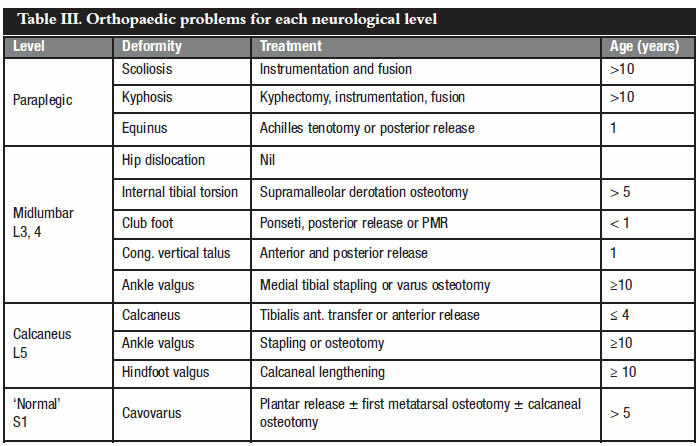 The orthopaedic problems encountered for each level of involvement are given in Table III. Scoliosis and kyphosis occur almost exclusively in the paraplegic group. The incidence of scoliosis in our unit is 8% of paraplegic patients but the literature reports up to 80%.10 It occurs by the age of 10 years. Scoliosis results in pelvic obliquity with subsequent loss of sitting balance or loss of functional paraplegia as the patients require their arms to keep themselves upright. Pelvic obliquity can also cause an ischial trophic ulcer which can be very recalcitrant to treatment. 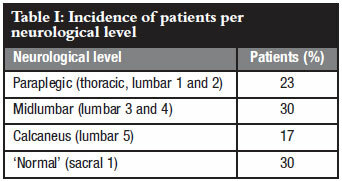 Severe scoliosis decreases lung capacity. Posterior fusion has evolved from Harrington rods to Luque instrumentation to the current pedicle screws and rods. The high incidence of non-union because of the absent posterior elements necessitated anterior instrumentation such as Dwyer or Zielke. Currently anterior inter-body release and fusion precedes posterior pedicle screws and rods (Figures 1 A and B). Kyphosis occurs in 8% of paraplegic patients in our unit. Due to the severe lateral displacement of the posterior elements, the erector spinae become perverted flexors. The severe kyphosis leads to loss of sitting balance but the main morbidity is the recurrent ulceration due to the underlying bony prominence. To obviate this significant and costly problem, the best treatment would be to excise the vertebrae involved in the kyphus and fix the spine with tension band wiring at the primary closure soon after birth. However, due to lack of neurosurgical and orthopaedic communication, this does not seem to occur. The patient is left to around 10 years of age in order to obtain as much body height as possible from lumbar spine growth. A kyphectomy and posterior rodding is then performed (Figures 2 A and B). Unlike the unstable hip in cerebral palsy, long-term studies of up to 40 years have shown that the unstable hip in myelomeningocoele does not result in painful arthritis.20 We have therefore not attempted to stabilise the midlumbar hip since 1992. The only rare exception would be a patient with asymmetrical involvement, where the one side is normal and the other side is midlumbar level. In our experience the knee rarely requires surgery in ambulant myelomeningocoele patients. Hyperextension deformity mostly responds to treatment with serial plasters in patients under 1 year of age. If persistent, V-Y quadricepsplasty with or without capsular release can be done. 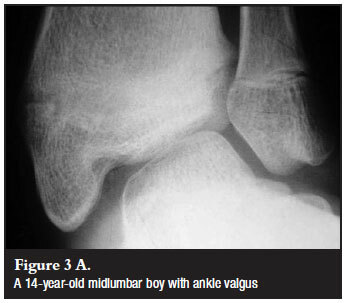 External tibial torsion is seen in older children and aggravates valgus at the knee and ankle. We have treated tibial torsion with a supramalleolar derotation osteotomy, crossed K-wires and plaster, but have become disillusioned due to a high incidence of delayed union. T-plate fixation, which we have used for the last two years, has eliminated this problem.24 The malleable transverse limb of a small AO T-plate is applied distal to the osteotomy. The plaster is changed at 3 weeks and the patient measured for AFOs, which are fitted when the plaster is removed at 6 weeks. The aims of treatment of foot deformities are to obtain a plantigrade, mobile and braceable foot, and hopefully avoid trophic ulceration which is a significant morbidity and can end in amputation. A very important study by Maynard et al, found that 94% of feet in myelomeningocoele require surgery. 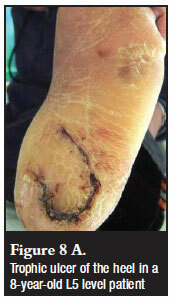 Post-operatively the incidence of trophic ulceration in flexible plantigrade feet was 0%, in flexible non-plantigrade feet 25%, in rigid plantigrade feet 36% and in rigid non-plantigrade feet 100%.25 It is therefore imperative to obtain a plantigrade foot and avoid operations that decrease hindfoot and midfoot motion, such as arthrodeses and posteromedial release. Equinus deformity often occurs in paraplegic and midlumbar patients. Our policy is to treat this at one year of age to facilitate transfer in paraplegic patients and ambulation in midlumbar patients. An Achilles tenotomy, or if required a posterior release (Achilles tenotomy, posterior capsulotomy and calcaneofibular ligament release) results in a plantigrade, mobile foot. 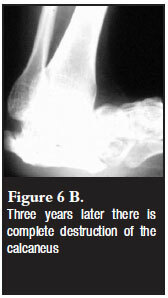 Club foot occurs almost exclusively in midlumbar patients. Early treatment with the Ponseti method does not cause subtalar stiffness. However, some feet are very stiff and resistant to Ponseti manipulation, and a posteromedial release may have to be done. We assessed subtalar mobility after club foot surgery and found that subtalar motion was never decreased after posterior release in normal or myelomeningocoele patients. After posteromedial release in normal patients the subtalar joint was almost always stiff, but not always in myelomeningocoele patients. We postulated the stiff subtalar joint in normal patients was due to the Z-lengthened tibialis posterior tendon that became stuck down, while in myelomeningocoele patients all tendons are cut.26 However, the mobility of the subtalar joint after posteromedial release in myelomeningocoele patients is not predictable; therefore a plantigrade foot is imperative to avoid trophic ulceration. Some feet are very rigid and require a talectomy as a primary procedure or after a recurrence.27 The standard talectomy should be preceded by a limited posterior and medial release via a hemi-Cincinnati incision through which the tibialis anterior, tibialis posterior, toe flexors and Achilles tendon are cut. This prevents a residual forefoot deformity after the talectomy. The treatment is similar to normal patients, except that in myelomeningocoele the involved tendons are cut. At 1 year of age a simultaneous anterior release (tibialis anterior, extensor hallucis longus and extensor digitorum communis tenotomy with open reduction of the talo-navicular ± the calcaneo-cuboid joint) and posterior release (Achilles tenotomy ± posterior capsulotomy) are done. 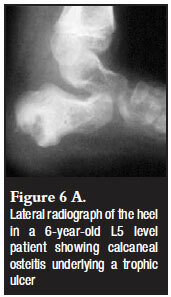 A valgus foot occurs in the midlumbar and L5 level myelomeningocoele. In ankle valgus the callosity is under the medial malleolus and in hindfoot valgus the callosity is under the talar head. In the immature patient (with at least 2 years of growth remaining), stapling of the distal medial tibial growth plate gives good results.30 Three small Blount staples are used and the staples are left in situ until there is 10º overcorrection into varus. In the mature patient a varus supramalleolar osteotomy described by Wiltse is the best option.31 It centralises the mechanical axis of the tibia over the talus and does not have the prominent medial malleolus found after medial wedge removal (Figures 3 A and B). 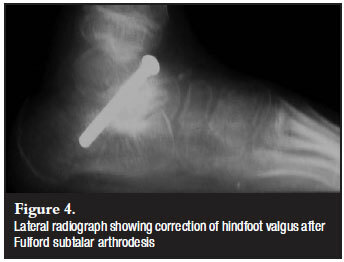 The workhorse for the treatment of hindfoot valgus has been the Fulford modification33 of the Grice subtalar arthrodesis.34 Although it remains a good option for the valgus foot in diplegic cerebral palsy, it results in a stiff hindfoot (Figure 4). 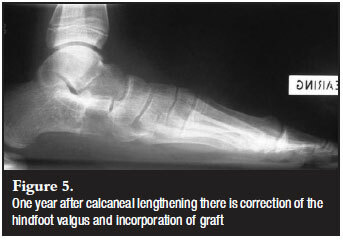 The calcaneal lengthening procedure first described by Evans35 and revived by Mosca et al36 is a better option as it does not affect the mobility of the subtalar joint (Figure 5). A calcaneus gait and a subsequent calcaneal deformity occur in patients with L5 level (plantarflexion without dorsiflexion) and weak S1 level (plantarflexion weaker than dorsiflexion). The weak pushoff results in a crouch gait, but more importantly a trophic ulcer of the heel which can lead to calcaneal osteitis and eventually destruction of the calcaneus (Figures 6 A and B). An algorithm for the treatment of calcaneus is given in Table IV. Weak plantarflexion of the flexor muscles in the sole of the foot without gastrosoleus results in cavus of the forefoot and a 'pistolgrip' bony deformity of the calcaneus. 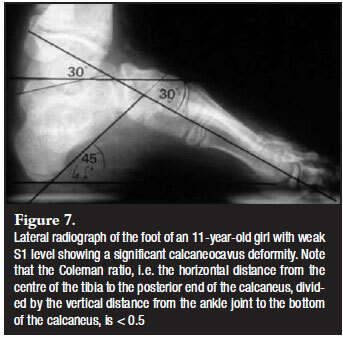 The cavus entity of this calcaneocavus deformity is measured by the Meary's angle (normal = 0º) and the bony deformity of the calcaneus by the calcaneal pitch (normal = 15º) and the Coleman ratio37 (Figure 7). If the Coleman ratio is <0.5, a superior displacement osteotomy of the calcaneus is indicated.38 This should be preceded at the same sitting by a plantar release to correct the cavus. Peabody described the tibialis anterior transfer to the heel in polio to replace absent dorsiflexion in 1938.39 The use of this transfer in myelomeningocoele has been controversial.40-42 The main controversies were the correct age to perform the transfer, and whether an anterior release would not give similar results. We retrospectively reviewed 46 procedures (36 transfers and 10 anterior releases) in 26 patients.43 We concluded that the best age for surgery was between 3 and 4 years. After 4 years the incidence of trophic ulceration increased from 0 to 30%. We will however observe a patient carefully after 4 years of age if we are not sure about the neurological level or voluntary power. To obtain effective plantarflexion after the transfer, the tibialis anterior must have 4 or 5 power. Trophic ulcers of the foot are due to a stiff, non-plantigrade foot or to a neglected injury in an insensitive foot. The surgeon should always endeavour to obtain a plantigrade, mobile foot.25 In a neglected injury the normal subcutaneous fat pad of the sole of the foot has been destroyed, and if the ulcer heals by secondary intent with scar tissue, it invariably breaks down again. The treatment of a trophic ulcer is to reconstitute a normal skin and fat pad by means of a medially based rotation flap (Figures 8 A and B). This should be preceded by correcting a non-plantigrade foot and removing bony prominences under the ulcer. If the ulcer is on the heel, the posterior calcaneus can be displaced superiorly with the osteotomy described for the 'pistol grip' heel, even in the absence of a calcaneal deformity. Both Charcot arthropathy and fractures can present with an exaggerated clinical response of swelling, warmth and erythema. The wrong diagnosis of cellulitis, septic arthritis or osteitis is usually made. In Charcot arthropathy the initial radiographs are normal and the joint should be protected (initially in a cast for 6 weeks and then with an orthosis) to prevent further joint destruction and characteristic radiographic features. 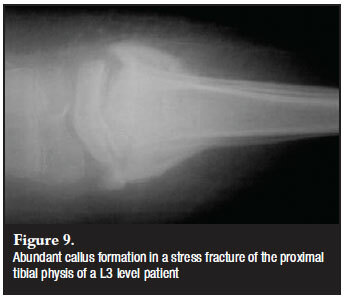 Fractures develop exuberant callus. In diaphyseal and metaphyseal fractures there is usually a history of trauma and appropriate immobilisation is required. 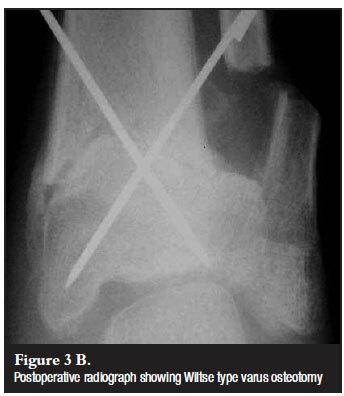 Physeal fractures are due to repetitive stress fractures in a poorly sensate limb and, similar to Charcot arthropathy, require long-term orthotic splinting after the initial cast immobilisation (Figure 9).47 Physeal bar formation with growth arrest can occur. The content of this article is the sole work of the author. No benefits of any form have been received from a commercial party related directly or indirectly to the subject of this article. Any research quoted in this article has been approved by an ethical committee.